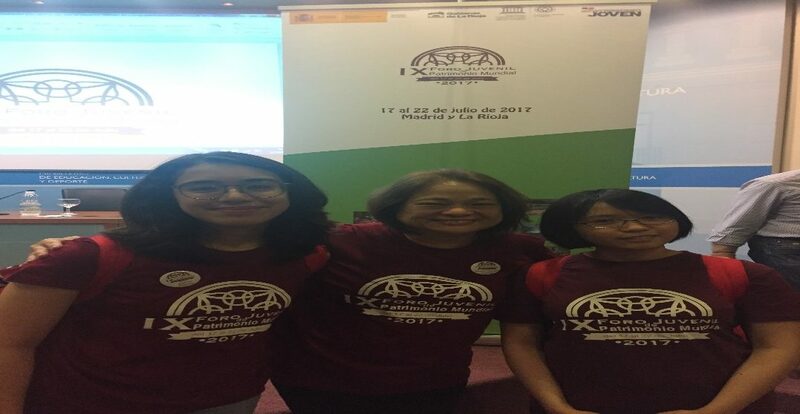 Two Filipino youth represented the Philippines in the 9th World Heritage Youth Forum held in Spain from 17 to 23 July 2017. The World Heritage Youth Forum, one of the most important activities of Patrimonio Joven, is a program of the Spanish Ministry of Education, Culture and Sports, recognized by UNESCO in matters of heritage education with children and young people. The first edition of the forum was held in 2009 following the celebration in Seville of the 33rd Session of the UNESCO World Heritage Committee. Since then there have been eight consecutive editions, which have won the recognition of the international community. Its objectives include the promotion of heritage conservation and identification of young people as actors of change. Rhiannon Jae Flores and Sofia Carmen Ortigas pose with their tutor-teacher during the launch of the event on 17 July 2017.